What is your bank details ? Is it possible that I can pay all together, so that I can save shipping costs ? Can I collect my cards in your office and when are you open ? Can I buy in your office cards which are not shown in your Online shop ? Can I pay with credit card ? Can I pay my orders with german postage stamps ? I achieved a voucher coupon. Where can I enter the code ? I have cards which not match with my interests. Do you purchase postcards ? The condition of my orders are not the same as you described it. Do I have to be registered to order something ? Do I need to have an email address to order ? Can I place an order without using the online order form as well ? I would like to be informed when there are new postcards from my collecting theme available. How much is the shipping cost ? Are there discount ? Where can I find the Privacy Policies of Ansichtskartenversand.com ? Data privacy at Ansichtskartenversand.com ? 1. Click the article you want into the shopping cart. You will find a button "into the shopping cart" in the detailed description of the article you want to buy. Click onto the button if you want to buy the displayed article. The article is now in the shopping cart. 2. Please fill in the order form. If all of postcards you want to buy in the shopping cart, click onto the link „to shopping cart“ / „to checkout“ in the lower left or upper right corner. Every article you put into the shopping cart will be displayed again. 3. Please double-check your data and the calculated value of your order. If everything is correcr please confirm through clicking onto the button „send order“. You send your order successfully. The account connections as well as the order value and the delivery charges will be displayed again. You will get these details in an email again. Please note down the data for your records. Email: info@ansichtskartenversand.com or call: 030 - 21 23 24 15 daily from 10 am to 6 pm. 1. What is your bank details ? 2. I bought postcards from Ebay and your Online shop www.ansichtskartenversand.com. Is it possible that I can pay them together, so that I can save shipping costs ? When you pay your orders, please indicate as reference the order numbers from the Online shop and Ebay. 3. Can I collect my cards in your office and when are you open ? Of course you can collect your orders in our office. Please have your order numbers with you. 4. Can I buy in your office cards which are not shown in your Online shop ? No. In our Onlineshop www.ansichtskartenversand.com you will always find our complete stock. 5. Can I pay with credit card ? No. Payments with credit cards are just possible by using Paypal. 6. Can I pay my orders with german postage stamps ? 7. I achieved a voucher coupon. Where can I enter the code ? Please enter the code in the field voucher-code during your order. You can find the field when you enter your delivery address. 8. I have cards which not match with my interests. Do you purchase postcards ? 9. The condition of my orders are not the same as you described it. We are always careful about a correct descriptions of the condition of our cards, so that you can be sure that the description and the condition match. If your are not satisfied with your achieved ware, please send them back within 30 days after you achieved your order. Your safety when you buy postcard: unlimited right of withdrawal. 10. Do I have to be registered to order something ? No, you don‘t have to register before you order something. Please enter your address into the order form. If you want to register yourself, please enter your address, your email and a password. Then you will be able to skip the address part in future, you just have to enter your email and password for future orders. 11. Do I need to have an email address to order ? No. The terms of payment and account connections will be displayed on your display after the order is complete, so you can copy them or print them. 12. Can I place an order without using the online order form as well ? including the order number(s) and your address. We are available from 10 am to 6 pm (local time), each day. 13. I would like to be informed when there are new postcards from my collecting theme available. You have got the possibility to subscribe for our Newsletter. Please choose your concentration area and enter your email address. We will inform you via email, if there are new postcards from your concentration area available. 14. How much is the shipping cost ? Are there discount ? The delivery charges depends on the count of your ordered cards. Of course, we offer discount when you order several postcards. The discount depend on the amount of the order value. 15. 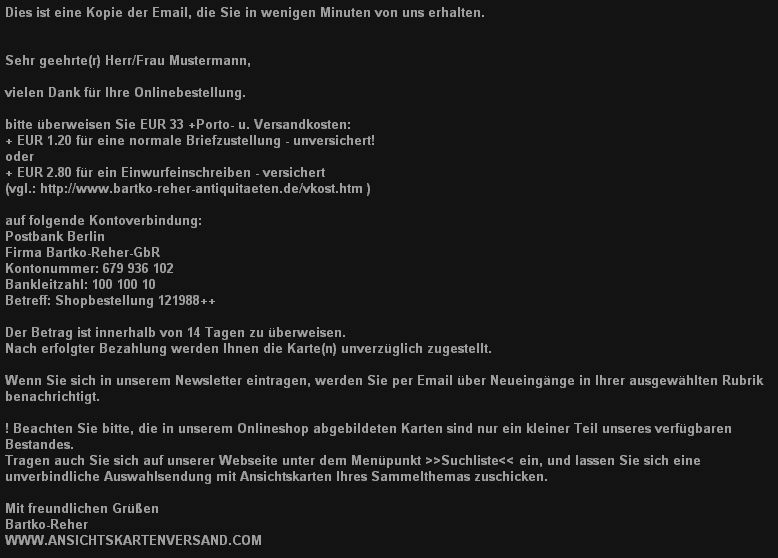 Where can I find the Privacy Policies of www.Ansichtskartenversand.com ? 16. Data privacy at www.Ansichtskartenversand.com ? We treasure your trust and we are very careful and have a high level of safety standards to protect your personnel dates from unauthorized access. Your order and your personnel dates are protect through engineered safety system und extra authority system. The transfer of your personnel dates which you enter in the Internet to unauthorized people beyond the business Bartko-Reher OHG is basically barred.